In some places it is as simple as a serene, leafy green picnic spot beside a stream; in others it is what city slickers call five-star luxury, complete with 800-plus thread count bed linen. Dairy farmers around New Zealand are increasingly welcoming visitors – Kiwi and international – onto their farms. There are the Fonterra farmers who open their gates to visitors in special open days, and throughout the year there are dairy farmers offering visitors a wide range of experiences, from daytrips and farm tours, to overnight stays; some with simply a great place to pitch a tent or park a motorhome, others with a room in the farmhouse, some with off-grid eco cottages, and some with secluded, sumptuously appointed standalone guesthouses. Farmers are landowners, guardians of unspoilt scenic places they are passionate about, but which are not normally seen or appreciated by the public. By opening their gates, they are offering guests experiences of a lifetime – and, along the way, insights into farming and the rural way of life. 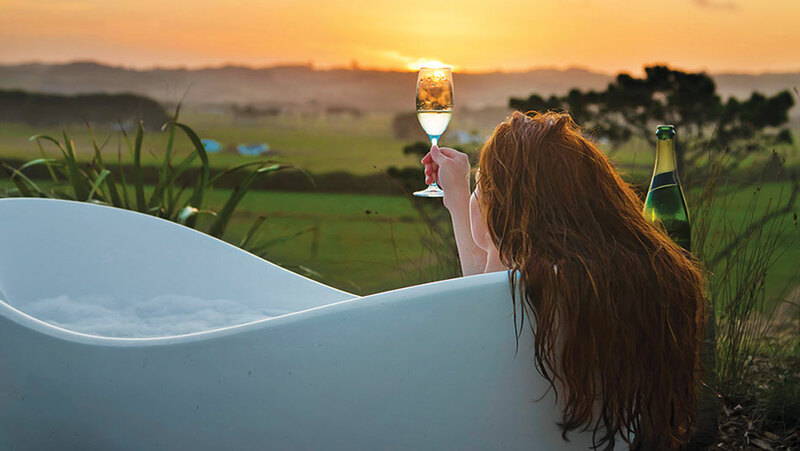 Sunset views, al fresco bathtub relaxation, and bubbles…all on a dairy farm that welcomes visitors. DairyNZ’s general manager responsible dairy, Jenny Cameron, says there is a veritable cornucopia of encounters – and colourful characters – awaiting visitors to dairy farms around the country. “Just as the farmers themselves are a diverse lot, their farming operations are also varied – small, large, organic, high tech; some are remotely located, while others are on the doorsteps of our major cities or surround rural towns. Ms Cameron adds that on-farm meal options range from self-catering to meals on request, or part of the tariff. Some farmers provide a basket of the basics – milk, of course, and a loaf of bread, or perhaps farm-grown produce. “And we know of more than one farmer who treats guests to whitebait during the season. Ms Cameron says holidays on farms make for great family memories too were the kids can learn where their milk comes from, pat the cows, and make friends with the other animals on the farm. An increasing number of farmers also ‘open their gate’ in the DairyNZ Find a Farmer service. This connects schools with dairy farmers who like to host parties of pupils on their farms, or go to the classroom to talk about dairy farming, including careers in dairying and the various scholarships that are available. As Waikato dairy farmers Michele and Roy Connell say ‘quite simply, New Zealand is too beautiful not to share’. It is their passion for their own farm and farming lifestyle – and for sharing – that prompted them to found Off the Beaten Track, which gets visitors into private, unspoilt places they could not normally access, or even know about. Michele Connell says, like the farmers that are part of their network, what motivates them is giving guests the chance to meet genuinely welcoming country people and have authentic experiences in rural New Zealand, not just somewhere to stay for the night. She adds that as farmers themselves, they are very aware farming can be economically challenging, and therefore farmers appreciate the diversity and additional income getting involved in tourism brings. Tourism officials around the country welcome farmers’ involvement. In New Zealand’s dairy heartland, the chief executive of Hamilton and Waikato Tourism, Jason Dawson, says dairy farmers opening up their gates, land, and homes to be explored by visitors creates social and cultural benefits for farming families and visitors alike. Venture Southland tourism product development coordinator, Cameron Richardson, says the region is one of the powerhouses of the New Zealand economy ‘so it just makes sense to combine agriculture, our largest industry, with tourism, our fastest growing industry’. Along with Off the Beaten Track and the i-Site visitor network, there are various websites listing farms offering visitor experiences.